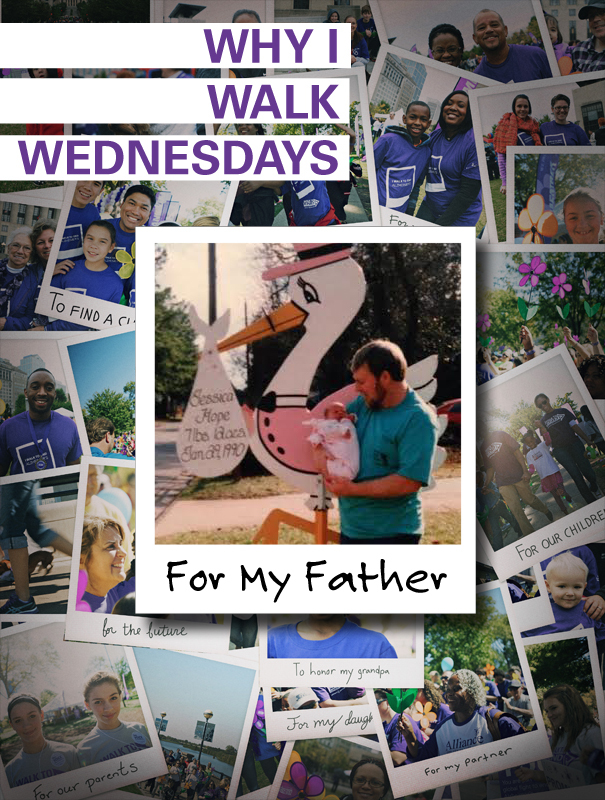 I walk for my father, Walter “Butch” Delaney Jr.
My father started showing symptoms of Alzheimer’s right before my 18th birthday in January 2008 at the age of 59. He would become very irritable and would mistake the television remote for the phone. By May of that year we had no choice but to place him in a facility because it was too much for me and my mother to handle alone. Weekends for the next 6 years were spent traveling to North Carolina to spend time with him. We would go to Wal-Mart to buy snacks, go to lunch and take long car rides. In 2011 I married my husband and we held a small ceremony at the facility so he could be a part of our wedding. We quickly had our daughter Aubree Grace in 2012 because I wanted to make sure my daughter met her grandfather. Although he could never remember her name it was a blessing to see them together. Unfortunately my father took a turn for the worst in February 2014 and was put on hospice. He passed away on April 25, 2014, the day my daughter turned 18 months old. I am 24 years old and I have lost my father to Alzheimer’s. I walk in his name in hopes that someday there will be a cure so that my daughter does not have to witness me going through the same horrible disease. Very compelling story. He was so young and Jessica so young. it’s an awful disease. We need to beat it.